This craft project uses a silky white tassel as the base to make a pretty little angel pin. 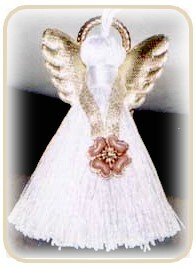 Make one tassel angel as a lapel pin for yourself or make lots to decorate the Christmas tree. These wee little angel tassels also make lovely gift tags. Glue gold ring to the top of tassel. Fold a length of ribbon in half (long enough to reach around the tassel)and secure the ribbon with a dot of glue at the back of the tassel. Create hands by gluing a decorative button, pin or anything similar to the two ribbon ends. Glue angel wings to the back on top of the ribbon used for hands (refer to photo). Glue a little bow to the back, center of the wings or write a message on the back of the wings and use in place of a gift tag.